Peter: (After shocking Chris.) What the hell was that? (Shocks Chris again.) Oh my God, Lois, don't get alarmed, but, I think I might be Jesus. I'm Jesus. Brian: Peter, that's a static shock. Your pajamas created a charge of electricity when you dragged your feet across the carpet and when you touched Chris, you passed it on. Family Guy Season 5 Episode 14: "No Meals On Wheels"
Peter: Ben Stiller, help me! Ben Stiller: No, Peter. I heard what you said about my movies. Ben Stiller: (points at his ears) Hello?! 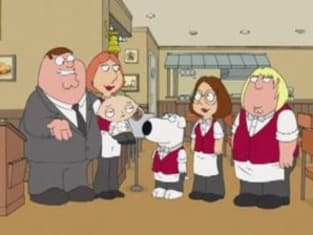 Peter: Ah, go to hell, you mutant offspring of comedy people! Peter: How can you leave me now Ben Stiller when I need you the most? Ben Stiller: I'm sorry Peter, but there are other children who need my help. Peter: I guess I was wrong to think you'd always be with me. Peter: His movies are terrible.